Well, some of you have been reading this blog for nigh on 4 months, and through this medium, I feel that we’ve built a solid and trusting relationship. Hence, it’s probably about time for me to admit something rather embarrassing. Just between you and me (and the search engines), until recently, I couldn’t write a SQL query to save my life. Well, I am pleased to say that I have joined the ranks of the literati again after taking some time over the weekend to pick up some basic query writing skills. I wouldn’t claim to be an authoritative expert in the field, but at least now I am somewhere in the advanced bumbler level. Honestly, it was a great experience. Everyone should learn SQL queries. I can’t wait till my kids are old enough to want to learn so that we can bond over writing queries. Looking at some existing queries that other folks have made for me, it kind of feels like the first time I walked into a restaurant in Seoul after having taught myself to read Hangul. So what to do with this newfound knowledge? Why, develop some slick portfolio reports, that’s what! 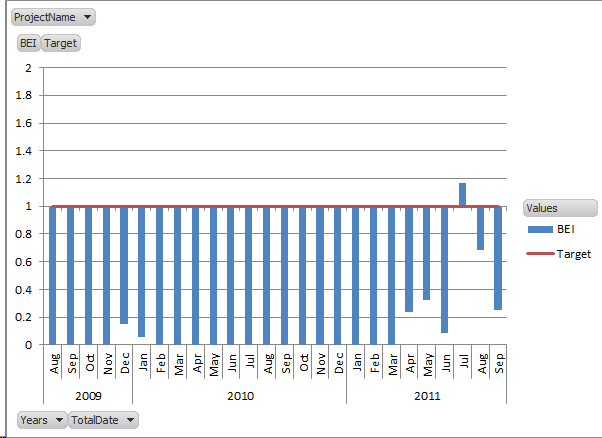 Hence today, I present to you the Baseline Execution Index (BEI) Report. In a perfect world, your index would be hovering right around 1. That means you are completing all of your tasks more or less on schedule. A BEI greater than 1 would indicate that you are completing more tasks each month than were baselined – and a BEI of less than one would indicate that you’re completing less tasks than were planned. This is another one of those reports that could be used at the portfolio level to indicate portfolio performance or at the individual project level to indicate project performance – both reports doable with the relatively low administrative overhead of simply requiring a baseline and a reasonably decent schedule update process. 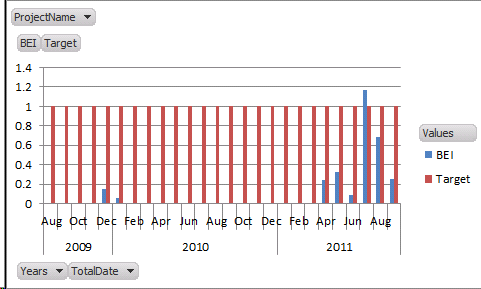 …which essentially is a modified form of the query I used last week to generate my Cumulative Milestone Report. What we’re doing is concatenating two sets of data, the Actual Finish dates for specific tasks as well as the Baseline Finish dates for tasks. Only baselined tasks are included. This ensures that we adhere to the current approved plan and ensures that project managers will not game the system by adding their own tasks. The Actual Finish Date and/or Baseline Finish Date is/are less than today’s date. We shouldn’t be reporting on Actual Finish Dates in the future because, well, there shouldn’t be any, and if there were, they would indicate the project manager requires additional training rather than a bonus for finishing early. Milestone tasks are excluded. As they do not indicate work and often are used to manage external factors, they should not be relevant to this exercise. Summary tasks are excluded. Including them would invalidate the data by introducing duplicate record sets. 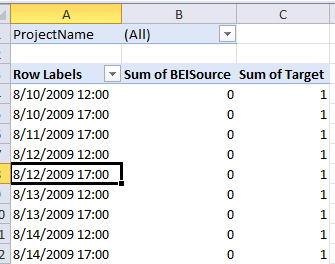 Open Excel and add the connection to the ODC you configured with the SQL query above. 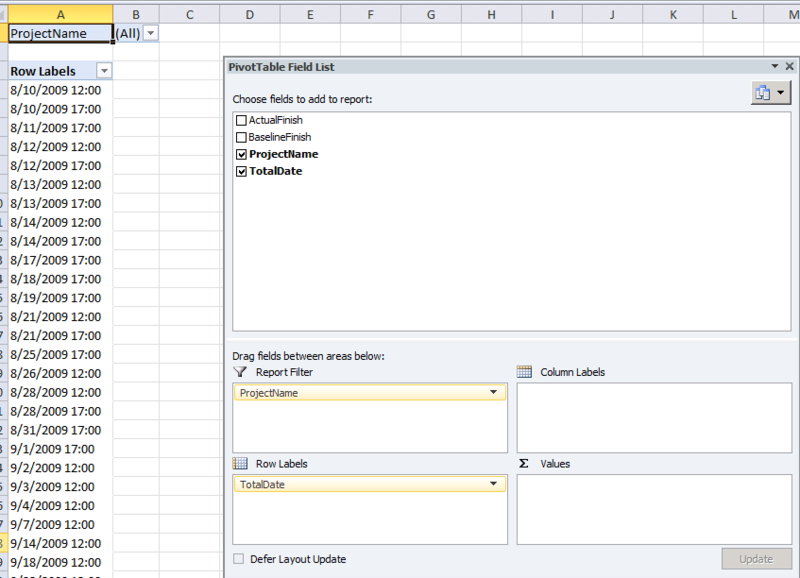 Insert a PivotTable based on that data and configure it as follows. 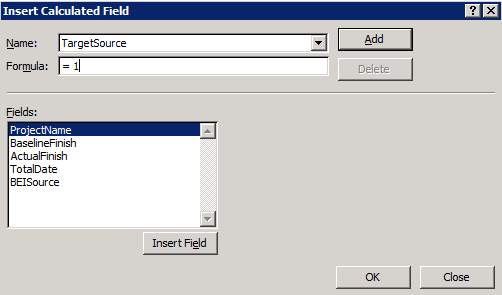 Now we’re going to add two calculated fields. 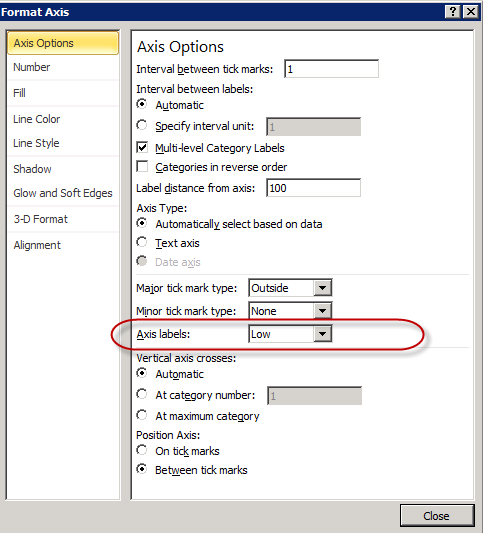 Click on the PivotTable and select the Options tab. 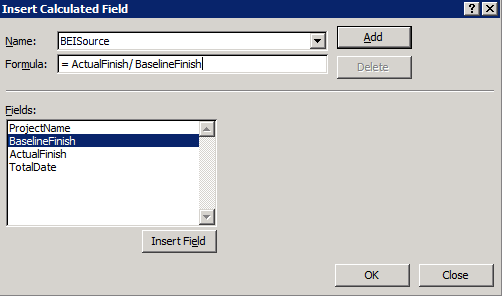 Click on Fields, Items & Sets to generate the two fields. Now we’ll add a “TargetSource” field. Rename the fields to something more user friendly. 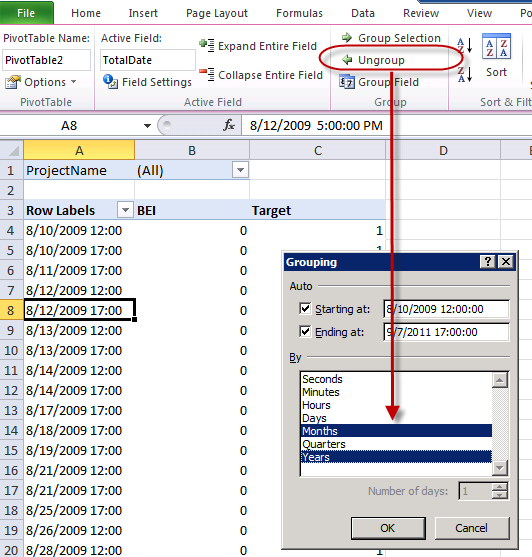 Group the data by clicking on the Total Date field and selecting the Group button under the Options tab. 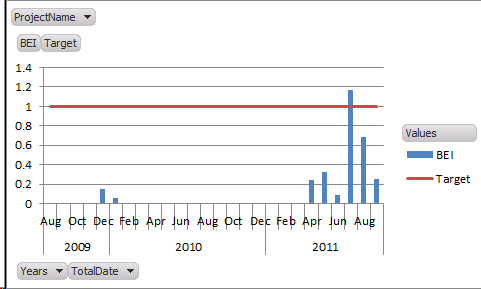 Group by Month and Year (or Quarter or whatever you would like). 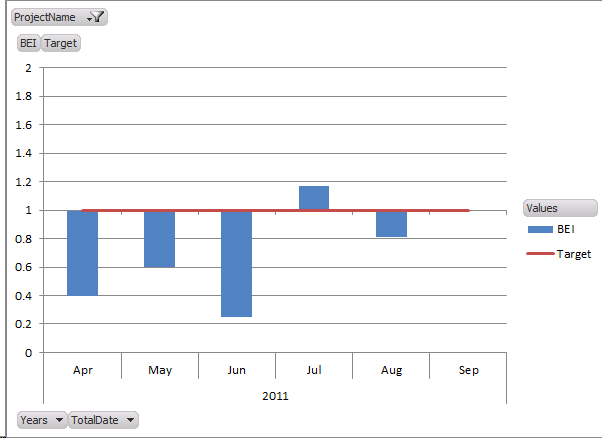 Now select the option to create a PivotChart. 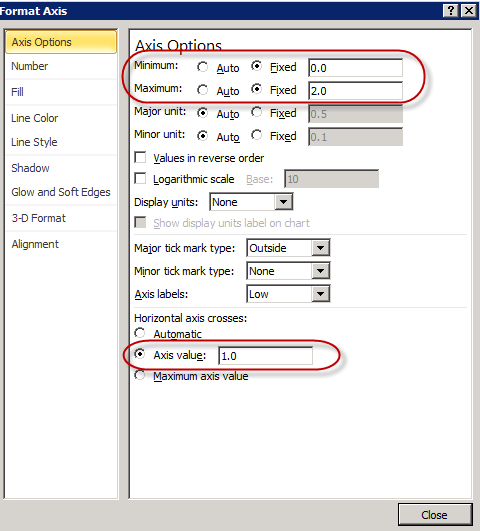 Use the column chart format. You should now have something that looks like this. 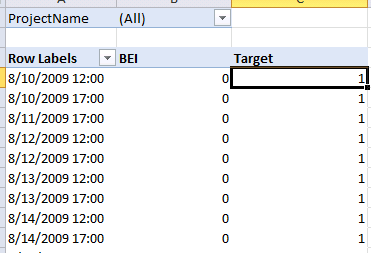 Right click on the Target series, and change the chart type to line. This gives us a nice benchmark to measure against. Looking at this illustration, I would conclude that we were getting about half the work done that we thought we would between April and June, then were able to pick up some of the slack in July followed by a slowdown again in August. …and now if you’ll excuse me, I plan to head out and solve the problems of the world with well-written SQL queries….